Teazle Wood covers an area of over fifty acres of land in North Leatherhead, Surrey, by junction 9 of the M25. The privately owned woodland suddenly came up for auction in 2012. On 31st July 2012, after an amazing campaign led by Lucy Quinnell, Teazle Wood was purchased by the Friends of Teazle Wood. The aim was to secure the wood from any possible development and to keep it in perpetuity as a woodland ecology and a nature reserve. The purchase was only made possible by the generosity of many people, businesses and organisations that care about saving the wood for the future, they both donated and loaned money to help meet the deadline auction date. In February 2015, the Friends of Teazle Wood founded the charity that will manage the future of the wood the Teazle Wood Trust. Registered charity number 1160532. The LAST sizeable area of woodland left in Leatherhead, provides a rural character, ‘backdrop’ views for Leatherhead, Fetcham, Bookham and Ashtead, and is part of the ‘green lungs’ of Surrey. 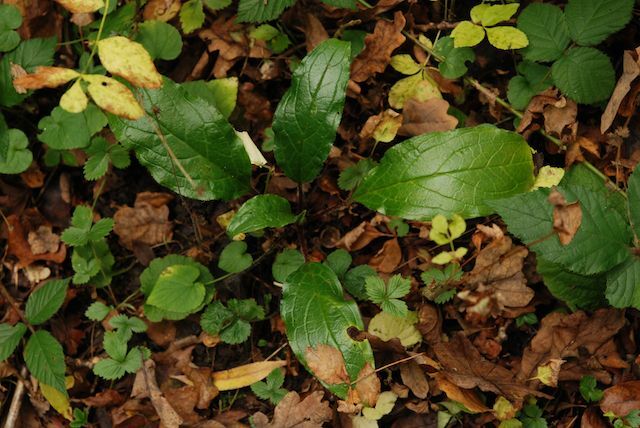 There are rare and protected plants such as Green Hound’s tongue and English bluebells. There is a healthy population of Great Crested newts, Stag Beetles, and Purple Emperor butterflies living in the canopy, owls, bats, yaffles (old English for woodpeckers!) and of course not forgetting the teazles that give the wood its name. There are significant historical and archaeological remains, including a Victorian brick works called Woodbridge Brickfield, which are part of our social history. Most of the ponds were clay pits although some were bomb craters from WW2 , they are now a haven for wildlife including the Great Crested newts. THIS IS A FRAGILE ENVIRONMENT so if visiting please keep to the public footpath. Teazle Wood has been neglected for decades. As tempting as it is to steam in and start clearing or even litter picking PLEASE DON’T! We have been advised that the woodland has to be restored and conserved very slowly and carefully to avoid causing any unnecessary damage to the ecology of the site. 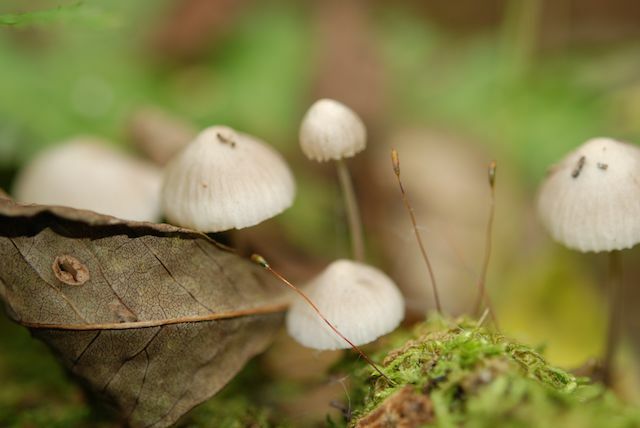 We need to work gently with nature to ensure the success of this gradually unfolding, long-term project. Approximately 50 acres. It is a vital ecological Site of Nature Conservation Importance which acts as a ‘Living Landscape’ corridor between Bookham and Ashtead Commons. 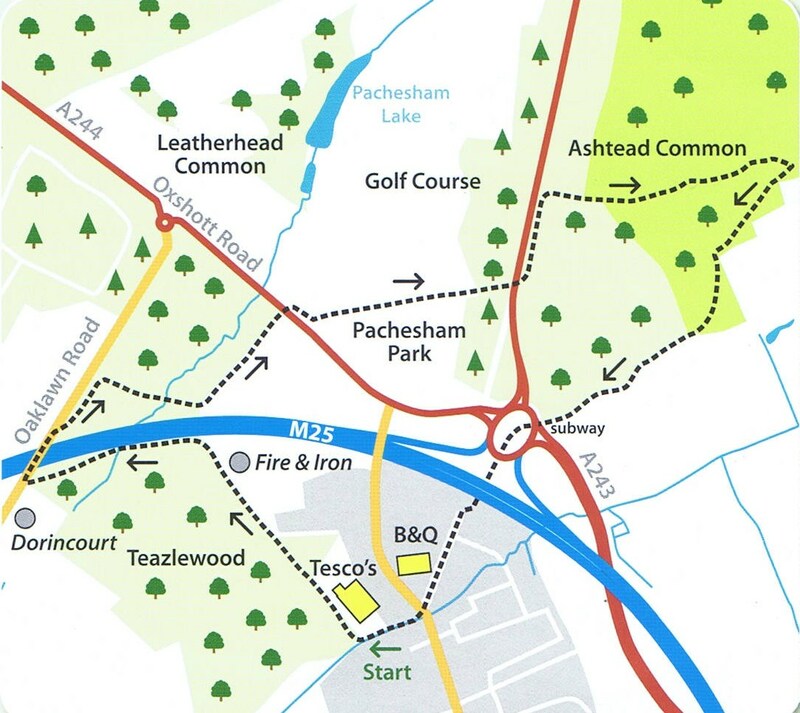 To do the Leatherhead Common Walk start at the entrance to Teazle Wood which is behind the Leatherhead Tesco store. You can get leaflets from The Lower Mole Countryside Project which include the map below.